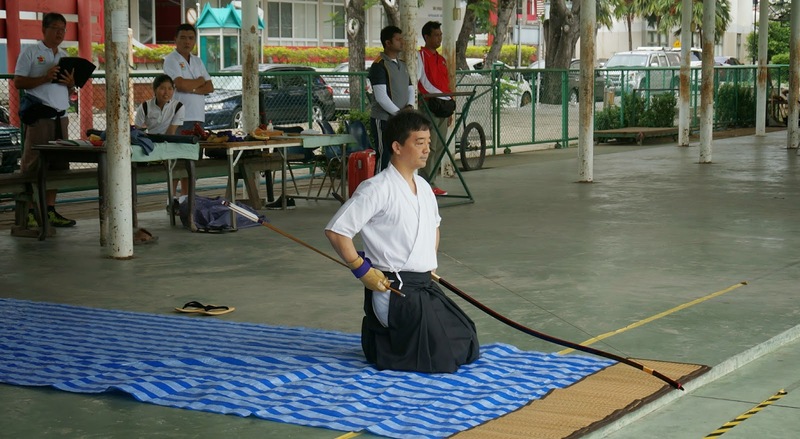 Siam Kyudo Kai: A visit by friend from World Archery! A visit by friend from World Archery! Last Sunday, our friend from World Archery group has come to visit us during their meeting with National Archery Association of Thailand. It was very nice to meet Pascal again, a great instructor and also a kyudo practitioner from Canada we met last year on the same grounds of the Hua Mark shooting range. Some of us demonstrated Zasha shooting and Yoshitaka Noda, a recent new SKK member from Japan with Yondan rank, performed a very accurate Kisa shooting. With so many pairs of eye watching, the practice become more intense. It reminds me the time I had doing Chuo Shinsa back in Nagoya Japan, in front of a very high ranked lineup of sensei, and that is a very good practice condition.